Admittedly, I don't watch this soap opera (or any for that matter), but I have seen it a few times to know its name and some of its stars. Actors like Deidre Hall, Peter Reckell, Kristian Alfonso, Drake Hogestyn, and Josh Taylor are among many others. Ken Corday, son of Ted and Betty Corday, the creators (1965) of this phenomenally long-running soap, has run the show since 1986 as executive producer. Ted passed away some months after he started Days of Our Lives and entrusted his beloved wife to continue with the show, which she did admirably. Betty passed away in 1987. Ken continued in his mother's footsteps, on his own and with her blessings, and has run things since, fulfilling a psychic's prediction that he'll have one job for life. This is the story of the families (Russian and Irish) behind Ted and Betty. Ted was from Canada and Betty from America. It's about his father's career — from puppeteer in Canada to lawyer to working in the theatre and becoming a Broadway director, all around the 1930s. He also went to war in 1942. Betty was in radio advertising when they met, and she went on to become a producer of radio soap operas before quitting to have their two sons. Ted was director on both The Guiding Light and As the World Turns for ten years before he and his family moved out west to California. Ken went on to play drums in a band and then got a degree in music. He talks about and pays tribute to many of the ladies on the show, like Susan Seaforth Hayes (Julie Williams); Suzanne Rogers (Maggie Horton); Peggy McCay (Caroline Brady), and Alison Sweeney, many of whom have been on board for decades. Corday also talks about the male actors and relates stories of the writers and their storylines, the comings and goings of stars, the deaths of his parents, and his brother's suicide. What's kept the show on air for so long? As Betty Corday said to her son as she handed him the reins, "story, story, story". Without good stories, there would be no point. 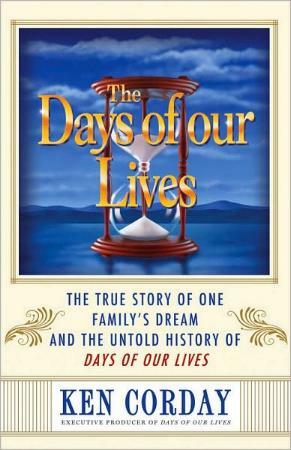 Conclusion - A very interesting and well-told story of one family's rise to success, and of the show itself. A must for all Days of Our Lives fans as they'll never read about these kinds of stories in the magazines.